"Samuel Sandys" redirects here. For other uses, see Samuel Sandys (disambiguation). Samuel Sandys, 1st Baron Sandys, PC (10 August 1695 – 21 April 1770) was a British politician in the 18th century. He held numerous posts in the government of the United Kingdom, namely Chancellor of the Exchequer, Leader of the House of Commons, Cofferer of the Household and First Lord of Trade. He was also a Justice in Eyre and Member of Parliament for Worcester and holder of the Sandys Barony. He was the son of Edwin Sandys, MP of Ombersley, Worcestershire – himself a descendant of Edwin Sandys, Archbishop of York. Baron Sandys married Letitia, eldest daughter and co-heiress of Sir Thomas Tipping, 1st Baronet. They had seven sons and the eldest, Edwin, inherited his title upon his death when his post chaise overturned on Highgate Hill. Edwin Sandys (28 April 1726 - 11 March 1797), 2nd Baron Sandys christened 14 May 1726 Ombersley, Worcs. Martin Sandys (c. November 1726 - 26 December 1768), christened 24 November 1726 Ombersley, Worcs. Daughter Mary inherited the estates upon the 2nd Baron's death in 1797 and was granted the Barony with a special remainder to her younger sons in 1802. Lee, Sidney, ed. (1897). "Sandys, Samuel". Dictionary of National Biography. 50. London: Smith, Elder & Co.
Cokayne, George E. (1896). "Sandys of Ombersley". 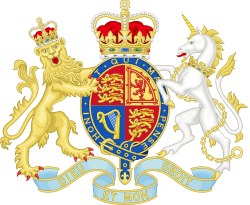 Complete peerage of England, Scotland, Ireland, Great Britain and the United Kingdom, extant, extinct, or dormant. Vol. VII, S to T. George Bell & Sons. p. 54. Horn, David Bayne; Ransome, Mary (1996). English Historical Documents 1714-1783. Volume 7. Routledge. ISBN 0-415-14372-1.